We’ve been looking at simply stunning staircases from all around the world and are continuously amazed by the spectacular designs that we come across. We’ve found another truly astounding example; the living staircase. In terms of building materials, wood, metal and glass staircases are the main contenders! But now we can add another to the list; plants! While the stairs themselves may be made from oak, the rest of this gloriously green staircase looks like a winding garden! In a recent blog, we spoke about the possibility of replacing and renovating spiral staircases. You certainly wouldn’t want to replace this one, though. 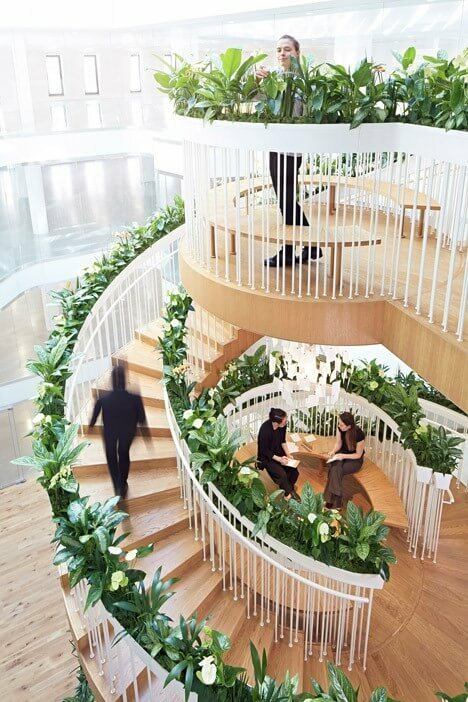 British designer, Paul Cocksedge, has created a beautiful spiral staircase for Ampersand, an office building in London’s Soho area that’s dedicated to creative businesses. In 2013, Cocksedge won the commission for the staircase with an idea for a spiral stairway without a central column. He worked with engineering firm Arup to create the final design. Dubbed ‘The Living Staircase’, at 12.5m high and 5m in diameter, this impressive structure took 13 months to build! 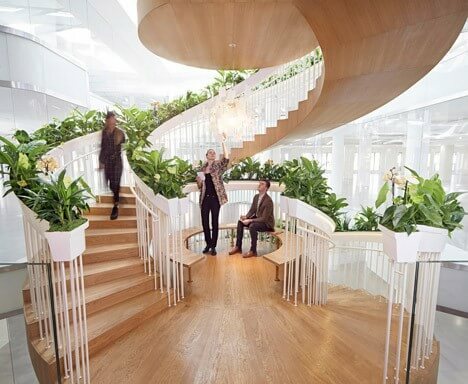 While the array of greenery looks like a floating garden, the ‘living’ element of the staircase doesn’t just refer to the plants and herbs in the tops of the balustrade. It also relates to the people using it. 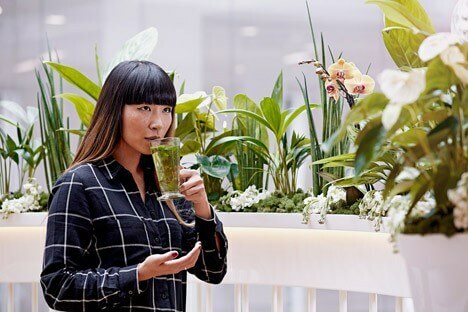 As well as being a means to get from A to B for the employees working at Ampersand, the living staircase also lets members of staff contribute to the working garden. They can use the ingredients grown within it for their lunch or to make a fresh cup of mint tea. Sounds delicious! This new staircase doesn’t just look amazing, it’s multi-functional too! With a wider diameter compared to a conventional spiral staircase, there’s enough space for three circular platforms, which are used as social spaces. Whether you’re reading a book, relaxing with a cup of mint tea or catching up with colleagues, you can use the space for whatever you want to do! As the office space is rented to several creative companies, this central suitcase gives employees from different organisations the chance to socialise and network with each other. 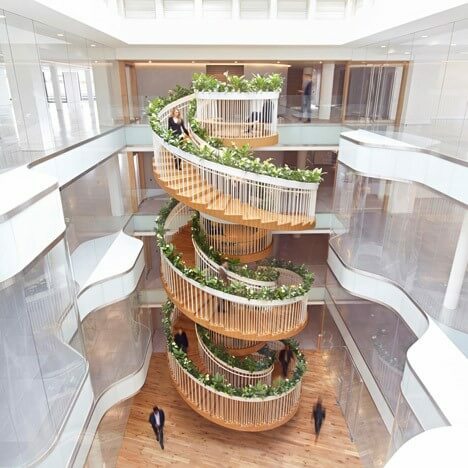 Designed to encourage ‘chance meetings’ between employees, this four-storey impressive structure gives us stair-envy! Using the lift in this building almost certainly looks the most boring and anti-social way of getting around the Ampersand building. 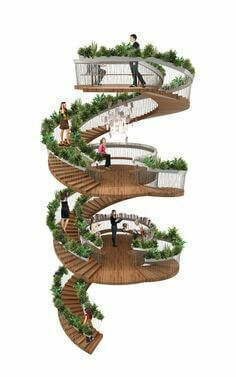 This living, social staircase is where it’s all happening. Each section of it has a specific function. This is where they keep the hot water machine and encourage users to brew their very own healthy cups of tea using the mint plants grown on the staircase. Tea breaks with a magnificent view! On this level, you’ll find a Zettel’z 5 lamp, designed by German lighting designer Ingo Maurer. Cocksedge designed this floor hoping that the workers will leave notes for each other using the pieces of paper that hang from the steel chandelier. Ideal for all the bookworms, the first floor has a whole library of books selected by the design team to inspire and entertain. A great way to get those creative juices flowing. If you want a staircase that brings your home to life, get in touch with us to discuss your staircase renovation.